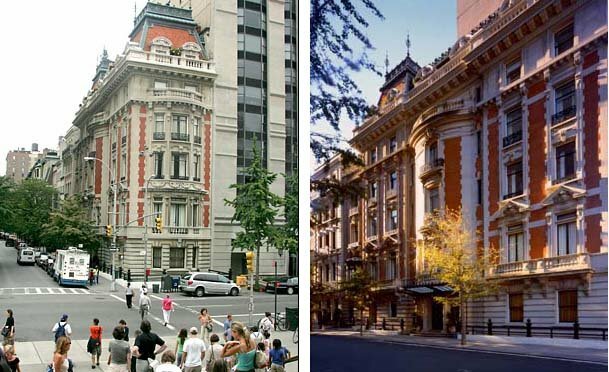 Built in 1901, the facade of the Semans house faces Fifth Avenue and runs down the side of East 82nd Street. It includes two outdoor terraces and offers amazing rooftop views of Fifth Avenue & Central Park. It is located directly across from the Metropolitan Museum of Art and features 11 marble fireplaces, three elevators and a sweeping brass-and-wrought-iron staircase. One of the bathrooms is said to be finished entirely in black marble. With its 12-foot high ceilings, gold-leaf trimmed fixtures and intricate plaster friezes, the property is a living piece of architectural history. Martha might take a little sigh of relief, though. The house needed a further $10-million in renovations to convert the mansion to a single residence again, which had been previously divided into three apartments. Andrew, I agree with your comment about this house not feeling like one of Martha's homes. Maybe she had a vision for it that I just can't see... I have to admit, though, that it has always surprised me that Martha has not invested more real estate $$$ into NYC properties, given the proximity to her offices. Andrew, I couldn't agree with you more. While the house is stunning, it is just not Martha. Bedford suits her perfectly - country elegance with an eye towards lifestyles of a bygone era. I think Martha has done the right thing since her legal troubles in emphasizing the more aproachable side of her persona. I think with the advent of her Sirius radio show, her myspace page,and then her blog, plus other public outreach projects,she has shown a warmer, more likeable public face. I think an aquisition like this mansion would have been a set-back for her image, and made her seem imperious and elitist, especially so soon after her legal problems.